Upper and lower arm sections joined by the elbow coup. Right and left sides are open on the inside to fit a large range of arm sizes. Also allows for some lateral adjustment. 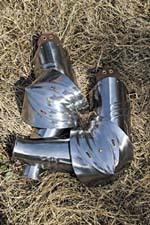 18 gauge steel, made to complete our Gothic Cuirass set (see below).